The online game, presented by Internet Explorer, has players making a last stand amid a wasteland of old Explorer browser windows. As most of you are probably aware, Microsoft announced it was ending all support for Windows XP this week, looking instead to focus on its newer operating systems. But what about those left behind? Those stuck in the past? Those who have yet to ... Escape From XP! For them, Internet Explorer has put together a short but clever flash game which plays out like a 2D twin-stick shooter. 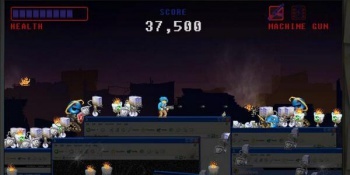 Players control the final developer for Internet Explorer 6, fighting the good fight against flaming Recycle Bins and laser-equipped Explorer icons for as long as their health lasts. Looming in the background, gazing upon the blasted landscape like some sinister god, is none other than the Office Helper paperclip himself. The main goal is to rack up as high a score as you can, since no matter how hard you try you wont' be able to stop XP from going up in flames, much like the operating system itself. As if to drive the point home, at the conclusion of Escape From XP players get the chance to push a big red button, nuking the last remnants of the OS. Give the game a try at the link below.